From the NBC10 Weather Center… Today (Monday): Rain breaks into showers by mid-afternoon. Highs around 50. Overnight Monday Night: Chance sprinkle, lows around 40. Tuesday: Cool and cloudy, late showers. Highs only in the 40s. Cape Cod Radio Forecast… Today (Monday): Rain breaks into showers by mid-afternoon. Highs in the lower 50s. Overnight Monday Night: Chance sprinkle, lows in the lower 40s. Tuesday: Cool and cloudy, late showers. Highs only in the middle 40s. An incredibly complex weather setup in the Northeast has meant incredibly varied conditions over New England for our Monday, from an expected 6 inches of snow in parts of Maine and New Hampshire to temperatures in the 60s in Connecticut – a meteorologist’s dream! We’ll start in the north, where a cold northeast wind from Canada delivered enough cold for snow to fly, sticking not only to the grass but also to the roads, resulting in accidents even on highways Monday. Snow will not only stick but accumulate in most of Maine along with Central and Northern New Hampshire, with the mountains picking up over half a foot in the high terrain, with 2 to 5 inches far more common for the rest of these northern areas. 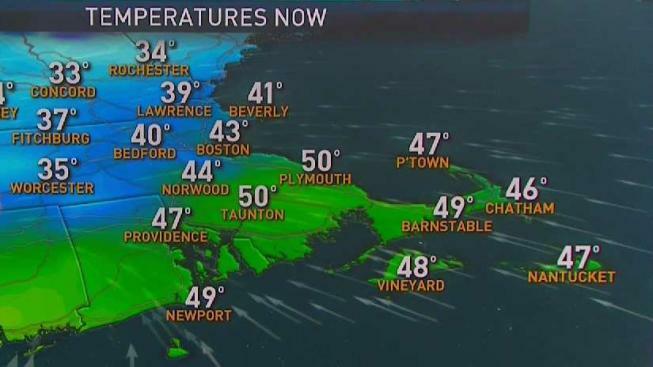 Farther south, it may not be snowing but the cold air certainly has made itself known, taking predawn high temperatures near 50 and sending them down closer to 40, except in far southern New England, where the milder air has been holding on and temperatures in Connecticut, possibly into Rhode Island, should rise into the 50s and 60s except for the hilly terrain in northern parts of both states. Though steady rain breaks up Monday afternoon, at least some showers will continue into the evening before cool air pushes even farther south overnight Monday night, sending low temperatures into the 30s for many, resulting in some pockets of black ice in Central New England, including Northern Massachusetts. This also sets up a downright chilly Tuesday with pockets of drizzle and sprinkles, flurries north, and highs in the 40s with wind chill values in the 30s for the Red Sox home opener Tuesday afternoon! By Tuesday evening, another round of showers and embedded downpours burst across New England with snow bursts in central, western and northern areas and leaving snow and rain showers to linger all the way into Wednesday with highs again only in the 40s. Thursday and Friday bring marked improvement ahead of returning mild air Saturday with highs in the 60s, but right now our exclusive First Alert 10-day forecast shows cool showers for Marathon Monday – something we’ll surely be keeping an eye on.